Progressive folk band about whom almost nothing is known. In 1973 they appeared in the national song contest, i.e. the competition which selects Ireland's entry for eurovision, performing "An Speirling" ("The Wind"). They finished fifth. A recording of this song probably exists but it was never released as a single. It probably includes orchestral backing as per the rules at the time. Clannad appeared in the same national song contest with "An Phairc" ("The Park") which finished joint sixth with Family Pride. 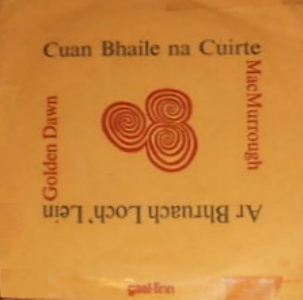 In 1974 they recorded a split single with MacMurrough as part of a series released by Gael Linn. This is an impressive track with beautiful female vocals. Alas there are no other known recordings. If you know any more about Golden Dawn, please get in touch.